The State Education Department does not discriminate on the basis of age, color, religion, creed, disability, marital status, veteran status, national origin, race, gender, genetic predisposition or carrier status, or sexual orientation in its educational programs, services and activities. Portions of this publication can be made available in a variety of formats, including Braille, large print or audio tape, upon request. Inquiries concerning this policy of nondiscrimination should be directed to the Department's Office for Diversity, Ethics, and Access, Room 152, Education Building, Albany, NY 12234. Recommendation 1. Create NOVEL, the New York Online Virtual Electronic Library, to deliver high-quality, reliable digital information to all New Yorkers. Recommendation 2. Ensure that all New York's students are information literate by providing strong school library media programs that include appropriately certified professional staff, adequate resources, and technology. Recommendation 3. Promote the availability of local public library service to all New Yorkers and improve local support for public libraries through the formation of Public Library Districts. Recommendation 4. Promote equitable library services for all New Yorkers through a need-based formula to reduce disparities in public library funding, and create NY EXCELS to promote service excellence in all types of libraries and library systems through enabling and incentive aid. Recommendation 5. Provide support for public library construction, expansion, and renovation to ensure that New York's libraries are accessible to all library users and can accommodate advances in technology. Recommendation 6. Improve the capacity of New York's urban public libraries to meet the unique needs of diverse library users in underserved, densely populated communities. Recommendation 7. Strengthen the ability of New York's libraries to help library users acquire basic English literacy, information literacy, and computer literacy skills in their communities. Recommendation 8. Enhance access to the specialized resources held by New York's academic, special, and research libraries to improve educational achievement, economic development, and health care for all New Yorkers. Recommendation 9. Support and enhance a highly skilled library workforce to meet the information needs of New Yorkers. Recommendation 10. Provide leadership for change by strengthening the expertise and accountability of the New York State Library and by creating a statewide advocacy coalition. The library is one of democracy's fundamental institutions. Created by ordinary citizens to empower all the people of our society, it plays a critical role in the free exchange of information. As the guardian of freedom of thought and freedom of speech, it provides each of us with the opportunity to improve and enrich our lives. Today we stand at the point in history when libraries must provide the essential pathway for all the people of New York to become full participants in the information age. As institutions that have shown an amazing ability to transform themselves to meet changing needs, libraries have been in the forefront in embracing new information technologies. They have become the vehicle for delivering the benefits of those technologies to all New Yorkers. While our state is home to some of the greatest and most-used libraries in the world, many of its libraries lack the critical resources to meet the growing needs of their communities. As we enter the 21st century, it is time for profound change in libraries statewide—change that calls for strong leadership and advocacy on behalf of the people of New York. Levels of library service available to the citizens of New York State are grossly uneven, ranging from world-class to woefully deficient. Too many New Yorkers are using library buildings that are inadequate and unsafe, and too many libraries are not accessible to all in their communities. More than one million New Yorkers have no local public library at all. New York's elementary school students often have shockingly meager library resources and programs. Library users do not have universal access to a core collection of accurate, reliable electronic information resources. New York's vast research collections are unavailable to too many of our citizens, and irreplaceable resources are at severe risk of loss through deterioration. Libraries in New York's densely populated inner cities cannot meet the needs of residents for want of adequate resources. As more and more New Yorkers turn to their libraries to learn critical literacy and information literacy skills, libraries cannot keep pace with the demand. Urban libraries cannot find enough professional librarians to fill positions in inner-city neighborhoods, while would-be librarians lack access to library education. The New York State Library does not have the staff and essential resources to support libraries and library systems in meeting users' needs. To address the needs of the citizens of New York, the Commission strongly recommends the following ten initiatives. We believe that these recommendations, if implemented, will transform library services in our state. Create NOVEL, the New York Online Virtual Electronic Library, to deliver high-quality, reliable digital information to all New Yorkers. Ensure that all New York's students are information literate by providing strong school library media programs that include appropriately certified professional staff, adequate resources, and technology. Promote the availability of local public library service to all New Yorkers and improve local support for public libraries through the formation of Public Library Districts. Promote equitable library services for all New Yorkers through a need-based formula to reduce disparities in public library funding, and create NY EXCELS to promote service excellence in all types of libraries and library systems through enabling and incentive aid. Provide support for public library construction, expansion, and renovation to ensure that New York's libraries are accessible to all library users and can accommodate advances in technology. Improve the capacity of New York's urban public libraries to meet the unique needs of their diverse, densely populated communities. Strengthen the ability of New York's libraries to help library users acquire basic English literacy, information literacy, and computer literacy skills in their communities. Enhance access to the specialized resources held by New York's academic, special, and research libraries to improve educational achievement, economic development, and health care for all New Yorkers. Support and enhance a highly skilled library workforce to meet the information needs of New Yorkers. Provide leadership for change by strengthening the expertise and accountability of the New York State Library and by creating a statewide advocacy coalition. In these recommendations, Commission members have elected to propose state aid and incentives for change rather than propose new mandates under New York State Law. These recommendations, explained in the following pages, are driven by the Commission's belief that every New Yorker in every community across the state should have equitable access to quality library service. We envision the library as a center of activity and learning in every community. It will continue its historic role as a place for books and tranquility, but it will embrace the 21st century technologies that help to meet the diverse information needs of all New Yorkers. New York State can and should be a leader in library services. We believe that the adoption and implementation of these recommendations, with the support of the Board of Regents, the Legislature, the Governor, and the people of the state, will redefine the future of New York's libraries and enhance the quality of life for all New Yorkers. To function successfully in today's society, New Yorkers must have equitable access to information resources—including high-quality, reliable electronic resources. New York must help close the digital divide for all its residents by making high-quality electronic information accessible to library users,regardless of economic circumstances, geographic location, or disabilities. Many New Yorkers still do not have access to the Internet or the skills to find and use electronic information. Even those who can afford access frequently need information that is distributed by commercial interests through subscriptions that are far too costly for individual users. Currently 37 other states have implemented programs to provide access to digital resources for their residents. The Commission believes that New York must open the door to the wealth of electronic resources for all its residents, including remote users, through local libraries statewide. NOVEL will encompass all types of libraries: public, school, academic, and special (non-corporate) libraries, such as medical and hospital libraries. It will be a gateway to a vast array of resources that will provide a rich electronic collection for schoolchildren, college students, scholars, and all New York's diverse populations. Shared electronic catalogs and newly digitized materials will offer a statewide electronic library for all New Yorkers. All New York's libraries must be technologically equipped to provide access to NOVEL for their users. Libraries must also be equipped to respond with agility to changes in technology, such as the advent of e-books and e-book readers. The Commission recommends that the Board of Regents promote policies to make high-speed access to the Internet available and affordable for all libraries and to enhance professional expertise in information technologies. Every library facility must be able to connect through a network that will enable the delivery of services that consolidate voice, video, and data. Library systems, in collaboration with the New York State Library, should help member libraries connect to NOVEL by defining equipment and telecommunications needs. New Yorkers will have access to NOVEL through an "electronic library card" issued by local libraries. Some libraries already provide remote access by using e-library cards to authenticate remote users, enabling them to see the library's holdings and have access to licensed databases acquired by the library. NOVEL will enable all of New York's libraries to make digital information from their collections available to users in their homes or offices. NOVEL is designed to complement existing services and partnerships among libraries of all types and to build on existing networks, such as the New York State Library's EmpireLink. Statewide purchase of quality electronic information enables EmpireLink to bring high-demand full-text information, such as the Health Reference Center database, to thousands of New York's libraries. NOVEL will not replace other cooperative arrangements if they are more beneficial to their users. Collaborative efforts of the State Library with all libraries, library systems, and library consortia and organizations provide the platform for NOVEL. NOVEL is also intended to enable libraries to create and share digital collections. Many of New York's libraries have begun to digitize important items from their print, photographic, manuscript, and archival collections. Digitization helps share many unique documents while limiting the need for handling fragile materials. By supporting these efforts, NOVEL will begin to build an online collection of materials that will be available to support New York's research needs. Facilitate the formation of a statewide development team to implement NOVEL. Work with systems to ensure that local libraries provide access to statewide resources through e-library cards issued by the libraries. Support development of mechanisms to authenticate remote users. Develop strategies to ensure access for users currently without local library service. Partner with library systems, consortia, and other organizations to provide connectivity and complementary services. Encourage interlibrary loan by establishing EmpireQuickLoan, which will simplify borrowing and transporting printed library materials across the state, with compensation for document delivery and net lenders. Expand EmpireLink to include more databases, a core collection of journals, and other resources, especially reliable, high-quality health-related information that is much in demand by the public. Provide support for digitizing primary source materials in libraries across the state. Cooperate with library systems to build EmpireCat, a statewide virtual catalog of library collections, to make the list of holdings of all libraries electronically accessible statewide. Support efforts by library systems of all types to train staff in the use of NOVEL resources and network infrastructure and technology. Collaborate with library systems in helping member libraries provide library users with training in the use of NOVEL resources. Work with library systems to guarantee the continued privacy of user information, and to inform users of library privacy policies. Libraries represent a substantial, cumulative investment of state dollars. Through NOVEL, the state will leverage its investment many times over. Statewide purchasing permits significant savings. For example, under the existing contracts of EmpireLink, the cost per user for commercial databases is about one twenty-fifth the cost under individual libraries' contracts. Library users statewide will be able to locate materials more easily, and digital resources will be far more accessible. The value of library collections will increase as they are shared online. Cooperation among different types of libraries and library systems will increase as new links form between different types of libraries. For example, elementary and secondary schools can enhance their curricula and benefit students through electronic access to primary source materials in academic libraries. In public libraries, where a large percentage of users' questions involve health-related information, librarians will be able to help by using the resources of local hospital and medical libraries. A virtual library such as NOVEL represents a strategic advantage for New York. Ready access to accurate information will enhance economic development and the state's competitive position, help achieve the educational goals and standards set forth by the Board of Regents, and assist state and local governments in keeping their constituents informed. A more skilled and able workforce, as a result of better education and self-guided learning, and more productive enterprise development can improve the state's economy and increase tax revenues. An aging population in need of high-quality health-related information will have the resources to maintain or improve their quality of life. In addition to supporting educational, financial, legal, scientific, and technical efforts, NOVEL will also sustain cultural development and encourage exploration and creativity by enhancing access to artistic and literary resources. With support for digitization of materials now preserved in vaults and rare-book rooms of libraries across the state, unique sources of information will be available to all through NOVEL. To derive the greatest possible benefit from the resources available through New York's libraries, New Yorkers must be information literate; they must know how to locate, evaluate, and use information successfully. The place to establish the foundations of information literacy for our residents is in the schools. Focuses on the New York State Learning Standards. Emphasizes higher levels of student achievement. Integrates information literacy skills and core curricula. Supports and promotes the national American Association of School Librarians Information Literacy Standards for Student Learning. Provides resources and services to meet diverse student learning needs. Reinforces student opportunities for reading, listening, and viewing. Information literacy skills are increasingly essential to derive the greatest possible benefit from the resources available through NOVEL and the other resources of New York's libraries. All students should have access to school library media programs that will teach them to be information literate. However, many public schools in New York State are unable to provide their students with access to strong school library media programs. Students in these schools are less likely to receive instruction in locating, using, and evaluating information; have the services of a school library media specialist; have access to current, relevant resources, including print, non-print, and digital materials; and have access to appropriate learning technologies. Professional Staff: Certified school library media specialists will provide instruction in information literacy skills, select and evaluate resources, collaborate as instructional partners with other teachers, and promote and encourage students' enjoyment of reading. Resources: All students will have access to adequate and appropriate resources, including print, non-print, and electronic-based materials, at developmentally appropriate levels. Technology: All students will have access to technology, including expanded Internet access, to meet their diverse learning needs. Encourage the State Education Department and the library schools of New York State to work together to develop multiple routes to certification for those who want to become school library media specialists. Provide incentives for certification to classroom teachers and others who express interest in becoming school library media specialists. Include school library media specialists in Board of Regents Teacher Incentive Programs that prepare teachers for certification areas and schools with shortages, e.g., scholarships, loan-forgiveness programs, and grants to colleges working in collaboration with low-performing schools. Establish a presence in the Office of Elementary, Middle, Secondary and Continuing Education where adequate professional staff will have central responsibility for school library media programs and will provide leadership, support, and technical assistance. Increase the capacity of school library systems to provide leadership and support to school library media programs through professional development, resource sharing, and technology support. A strong school library media program will benefit all New Yorkers by enabling students and graduates of New York public schools to achieve the New York State Learning Standards at higher levels, be responsible for their own lifelong learning, become productive workers in an information-based society, and be informed citizens in a democratic society. All New Yorkers should live in a community that has access to, and supports, a quality public library, and all libraries must have adequate local support. To promote quality local public library service in all communities in New York State, the Commission recommends the voluntary formation of Public Library Districts statewide, except in New York City, which is served by consolidated library systems that provide library service for every resident. Public Library Districts can take a number of forms, offering flexibility and options to ensure that they meet the needs of libraries and their communities of users. Public libraries in New York State have evolved in a variety of ways—most often through grass-roots movements within individual communities dedicated to the democratic ideals of public education. The process has produced many vibrant, community-based libraries, but it has also resulted in inconsistent levels of service, with an estimated 1.3 million New Yorkers remaining outside the chartered service area of any public library. The Commission acknowledges the value of local libraries as centers of community life that promote information literacy and afford opportunities for lifelong learning. However, it also recognizes the need for a vision for statewide public library service that will include New Yorkers who currently have no local public library or suffer from significant inequities in library service. The creation of statewide Public Library Districts will leave no local community unserved, much as public school districts encompass the entire state to ensure that all children have access to education. Public Library Districts as outlined in this recommendation also provide for greater accountability to the communities they serve through public votes on library budgets and the election of library trustees. Experience has shown that in library districts where the public votes on the library budget, per-capita support is higher. When libraries have restructured as described below, support has significantly increased. Association library serving a school district with a public vote on the library budget and trustees. Special district library with no unserved contiguous areas. Two or more association, special district, or municipal libraries serving an entire school district or districts. For example, two association libraries that previously served separate common school districts could both serve a merged school district, or a town library and three association libraries cooperating could serve all the residents of a large central school district. Countywide library district, in which a public library system would coordinate the distribution of funds and the provision of service among the member libraries. For example, an independent, elected county library authority could present a countywide proposition for library service to the voters. The funds would be redistributed among the public libraries in the county according to a formula, e.g., on a per-capita basis. The local libraries within the district would maintain their local authority and decision-making powers. Regional library collaborative coordinated by a public library system in cooperation with several libraries in school districts, towns, and/or counties to provide universal regional library service supported by all residents. For example, a public library system could present a proposition for library service to voters and coordinate distribution of funds and provision of services to member libraries. Use state aid incentives to encourage all public libraries to adopt a Public Library District model appropriate for the community's needs. Urge all local school boards to find ways to provide public library service to unserved areas in their district in cooperation with regional public library systems. Provide special grants to public library systems to act as coordinators of library district development. Ensure that the State Library has adequate resources to fulfill its responsibility for developing quality library service in each community and providing technical assistance to communities and public library systems. Provide options in law and regulation that will enable library systems and local libraries to develop regional solutions that respond to local needs. Allow temporary waivers to specific components of the Public Library District model and existing minimum standards to encourage participation and progress. Local Library Support: Incentive aid would be available through grants of specific duration to local public libraries that implement one of the Public Library District models. A community's ability to support a library through local funding should be a factor in determining levels of incentive aid. System Aid: Each public library system would receive an administrative grant of specific duration to hire professional and support staff to implement the transition at the system level. New York State Library Support: The State Library would receive an annual appropriation for five years to implement the transition. The State Library would use the funds to hire and train implementation specialists, such as demographic and legal experts, to work with library development teams at the regional level. This funding is intended solely to implement the Public Library District program throughout the state. It is in addition to other funding proposals included in the Commission's recommendations. These strategies will require years of community effort, guided by a regional and statewide network of experienced professionals dedicated to the program. The concept of library development must be the focus of all involved in this task. If this recommendation is fully implemented, the 1.3 million New Yorkers who currently have no local public library service will be included in a Public Library District. In addition, all New Yorkers will have a voice in the governance and funding of their library, which in the past has consistently resulted in higher levels of local support. This recommendation does not require the dissolution of any existing libraries, and therefore preserves the local community library, a cherished institution in many communities. Our libraries in rich and poor communities alike must be equipped to provide access to appropriate resources for their users. All New York's libraries—public, school, academic, and special—must strive for excellence in serving the information needs of the people of New York. Need-Based Aid to Public Libraries: Per-capita support for public library service within New York State extends over a vast range—from a low of $.28 to a high of $233.55. The average per-capita local support in the state was $31.84 in 1998 dollars. A study conducted for the Commission concludes that a minimum funding level of $20 per capita (in year 2000 dollars) is necessary to meet the basic needs of public library users. However, significant numbers of New Yorkers live in communities with libraries that have funding below that level. Some of these communities lack sufficient local resources to support even the most basic library services. Statistics show that the communities that would benefit most from improved levels of library service are often the least able to fund them through local tax revenues. These include many inner-city and isolated rural communities in the state—those that are experiencing the highest levels of unemployment and other social and economic challenges. Increase state aid, and use the additional aid to reduce funding disparities and leverage local effort up to a minimum level of $20 per capita. Target the areas that lack the tax base necessary to support quality library service. This recommendation does not propose redistributing existing state aid. It proposes distribution of new state aid to remedy economic inequities, placing a greater emphasis on ability to pay and local effort. This new aid is not intended to replace local support; it is intended to stimulate and leverage ongoing support at the local level. Enabling and Incentive Aid Through the NY EXCELS Program: Additional funding in the form of enabling and incentive aid will spur excellence in library service for all New Yorkers through the NY EXCELS Program. After a basic level of funding is achieved, NY EXCELS will focus on fulfilling community needs and help libraries meet the challenge of rising costs, changing technologies, and diverse user needs. The Regents Commission is challenging individual libraries of all types to improve the quality of services they provide to their users, and to share responsibility in ensuring that all New Yorkers have equitable access to quality library service. To meet this challenge, libraries will require significant assistance from the state's interlocking network of library systems. Libraries will need coordination and technical help from the systems in implementing a number of the Commission's recommendations—e.g., the establishment of Public Library Districts, timely and effective implementation of NOVEL and its components, and substantially improving local school library media programs. Therefore, both individual libraries and all types of library systems will have the opportunity to participate in NY EXCELS. "Individual libraries" encompass public libraries (and branch libraries), public school libraries, academic libraries, and various special libraries, including law libraries and hospital libraries. Need-based enabling aid of a limited duration to achieve the goals of the action plan. Incentive aid, which will be awarded after completion of specific activities outlined in the library's action plan. A tiered system will be developed to aggregate certain types of accomplishments. Peer and library system review will determine movement from one service tier to the next. Incentive aid, which will be awarded after completion of specific activities in the system's action plan. A tiered system will be developed to aggregate certain types of accomplishments, and peer review will determine movement from one service tier to the next. The Commission affirms the need for library systems, and recognizes the essential role they must play in ensuring access to library services for all the people of New York. New York's library systems receive their principal funding from the state to provide support services to member libraries. State funding includes operating aid (to pay for staff, materials, supplies, and equipment) and program aid (to pay for successful programs such as the Hospital Library Service Program, automation and literacy initiatives, and Coordinated Collection Development). The Commission recommends regular cost-of-living increases to library systems to ensure continuation of essential basic system services. Accountability and Structure: The New York State Library and the library systems will develop criteria for evaluating system services to ensure both quality and accountability. The State Library will review these criteria regularly, and they will provide the basis for periodic system performance evaluations. The State Library will coordinate system plans of service to ensure implementation of a shared statewide vision. Incentives will be available to encourage systems to contract with one another to avoid unnecessary duplication of effort and gain operating efficiencies. Existing disincentives to system mergers will be eliminated, and new incentives will be available to promote system consolidation where appropriate. Pilot projects for system mergers will facilitate the process. Leadership: Enhanced trustee training and development are necessary to strengthen system boards of trustees. Systems that do not have lay boards in place should establish such boards. All system staff should develop new skills and refresh current ones through a program of continuing education. Even the most motivated librarians and staff cannot offer quality service to their communities if library buildings are inaccessible or crumbling and cannot accommodate advances in technology. To provide the necessary support for public library construction, expansion, and renovation, the Commission recommends a substantial commitment of additional state funds within a specific time frame to arrest the deterioration of the physical library infrastructure in New York State. Far from making libraries obsolete, information technology has sent more New Yorkers flocking to their public libraries. For many, the library is the only access point to electronic information and the only source of programs that enable lifelong learning and literacy. Particularly in disadvantaged areas, libraries are community centers. While libraries remain the traditional physical home of books, they also provide the means of self-improvement and education for our citizens. Data confirm that New Yorkers are using their libraries more than ever. The Commission's recent survey on public library use showed that 73 percent of New Yorkers used their public library in the past year, as compared to 65 percent nationally. Attendance data submitted by public libraries show that New Yorkers made 103 million visits to the state's 1,080 local libraries and neighborhood branches during 1998, an 18-percent increase in two years. Increased use means increased wear and tear on local facilities. Space to accommodate new programs and technology is at a premium. New York's public libraries need $800 million to renovate and modernize library facilities. Surveys indicate that two-thirds of library buildings need major improvements. Seven in 10 public library buildings outside New York City need facility improvements estimated at $300 million. The need inside New York City, which is home to more than 200 branches and central library units, is estimated at $500 million. The existing annual state investment of $800,000 in matching grants for public library construction is woefully inadequate in meeting the need, and no federal funds are currently available for public library construction. The Commission recommends that Regents programs for construction funding consider the condition of existing libraries and the needs of isolated or economically disadvantaged communities. The Commission also urges the Regents to propose a special accelerated construction program for libraries in the state's poorest communities. To receive aid for construction, renovation, or expansion, all libraries, branches, and library systems that provide local library services must demonstrate a commitment to ongoing local support. Experience with existing state aid for public library construction has shown that state grants serve as a very effective incentive to local funding. On average, each dollar of state aid for construction has yielded five dollars of local support. To ensure accountability and equity, each public library system will include in its system plan of service submitted to the State Library a strategy for use of construction aid. The State Library will assist the systems by providing expertise in assessing construction needs and opportunities. Additional support for library construction, expansion, and renovation will ensure that existing facilities now excused from compliance with current standards will be brought into compliance. It will give local libraries the support they need to leverage local funds, and it will further the process of ensuring that New York's libraries are accessible and can accommodate advances in technology. Improve the capacity of New York's urban public libraries to meet the unique needs of diverse library users in underserved, densely populated communities. New York State must ensure that its libraries are accessible to their communities and that library services are responsive to community needs. New York's urban libraries must have special support that will enable them to meet the unique demands of inner-city populations. To enable urban libraries to reach out to underserved communities and to address the high demand for services placed on these libraries by diverse populations, the Commission recommends that the Regents establish an urban library initiative in cities with populations of 50,000 or more. Expand the size and content of language programs, including both collection development in world languages and programming such as English for Speakers of Other Languages (ESOL) and citizenship classes, to help new Americans participate fully in our economy and society. Expand branch library hours on weekends and evenings to accommodate the needs of working residents, students, and others who cannot take full advantage of library services during current library hours. Improve outreach programs for underserved inner-city residents, particularly youth, seniors, the under- and unemployed, and recent arrivals from other countries. For more than a century, New York's libraries have helped prepare generations—especially those from abroad—to enter American society. With schools, libraries have been a staging ground for upward mobility. For newcomers to America, libraries provide a window on their new world as well as the tools to function in it. In an ever-changing social environment, New York's urban libraries face special challenges and require additional funding to reach out to and fulfill the needs of their users. Many cities in New York are home to an amazing diversity of cultures that include recent arrivals who speak languages other than English. Segments of our urban populations are economically disadvantaged and lack the means to continue their formal education, including young people—often African-American or Hispanic—who have not completed high school. Language Programs and Services: To serve New York's burgeoning population of new Americans, public libraries must provide print and electronic collections in an appropriate variety of languages. These language resources help newcomers communicate and acclimate themselves to life in New York while inspiring them to adapt to a new society. Although Spanish is the second most commonly spoken language in New York after English, newcomers in large numbers are arriving from Asia, Eastern Europe, Africa, and the Caribbean. These people bring with them new energies and abilities, but they also bring a multiplicity of languages and a need for resources that address their diversity. Although most new Americans are concentrated in cities, some have settled in New York's suburban and rural areas. The collections and electronic resources in other languages that are developed in the urban libraries can be accessible to non-English speakers around the entire state through NOVEL. Urban libraries will share their expertise in conducting ESOL programs with libraries in rural and suburban areas that have similar needs and concerns. In addition to collections and materials, urban libraries must also expand services that help newcomers adapt to their environment: ESOL classes, language instruction resources, job resources, and citizenship information. Large numbers of recent arrivals enroll in library-based ESOL and citizenship classes, job-preparation workshops, and family literacy programs where they are available. With support for and expansion of such services, newcomers can be more independent and self-sufficient in their daily lives and can become informed participants in society. For example, they can talk to and work closely with their children's teachers, communicate with doctors and other service providers, understand the news, and become informed citizens and voters. Expansion of Library Hours: Urban public libraries are experiencing record-high levels of demand for services. In 1999, New York City's public libraries circulated almost 40 million items. Its inner-city neighborhood branch libraries often serve populations as large as those of many small cities in New York. Urban areas have produced communities of insatiable library users who have limited means for buying books, cannot afford a home computer connected to the Internet, and have limited or no access to quality public school libraries at the elementary level. The public library facilities they depend on are often small, outdated buildings with inadequate seating and capacity for collections. Although urban public libraries are filled to capacity with users, many people find it difficult to visit libraries because their work schedules conflict with library hours. Others, who rely on their local library as the sole provider of educational and recreational reading materials, computers and Internet access, and critical programs and resources, need more library hours than current funding makes possible. Additional hours of service on weekends and in the evenings are essential to accommodate the huge demand for services. Outreach Services: Libraries must reach out to their communities to ensure that they are offering programs that meet users' needs and that their services are reaching the groups who can benefit from them. Efforts to reach out to those who traditionally have not used public libraries in great numbers are especially important. This outreach component of the urban library initiative should build on the existing Coordinated Outreach Services to Special Populations program currently in Education Law. This program is designed to "…identify, contact and provide library services to persons who are: educationally disadvantaged; members of ethnic or minority groups in need of special library services; unemployed and in need of job placement assistance; living in areas underserved by a librarian; blind; physically handicapped; aged; or confined in institutions." The urban library initiative will allow New York State to ensure that all its residents can participate in library services, and that public libraries are truly meeting the increasingly diverse and challenging needs of urban populations. New York's libraries should provide people of all ages with learning opportunities outside a formal school setting. These opportunities must include the development of skills in reading, locating, and using information effectively. Promote English literacy through instruction for adults who need to acquire or improve literacy skills, early-childhood programs that encourage pre-school learning, and collections of lifelong learning materials. Enhance users' information literacy skills through instruction in finding, evaluating, and using information in all formats. Strengthen library users' computers skills so that they can take full advantage of technology in finding and managing information. Libraries play a vital role in supporting both the formal educational goals of local schools, colleges, and universities and the lifelong learning pursuits of individual New Yorkers. Libraries provide the venues for adult literacy programs, early pre-school literacy programs, and family literacy programs. Increasingly, libraries are the places where the public can learn how to use a computer, surf the Internet, and access print and electronic resources from around the world. For many New Yorkers, the library is the only institution that provides free access to this technology and assistance from knowledgeable staff on how to use it. English and Family Literacy: Before New Yorkers can benefit from the resources in our state's libraries, they must possess basic literacy skills. Unfortunately, at least three million adults in New York State read at the lowest literacy level and lack the foundation of basic skills needed to function successfully in society. These individuals are not the only ones who suffer as a result of low literacy levels. Their employers lose productivity and profitability, and their children often experience lower academic achievement. For those New Yorkers without basic literacy skills, libraries must provide expanded opportunities to develop and foster those skills. Family literacy programs should include a combination of adult education to help adults build their reading and writing skills; early-childhood education that focuses on pre-literacy skills, such as vocabulary building and verbal expression; and parenting education that teaches families to participate in their children's education. In planning and conducting these programs, libraries must be sensitive to the diversity of New Yorkers. Lifelong learning materials, available in a variety of formats, should be suited to the needs and interests of local communities. Family literacy and information literacy are closely linked. The vast majority of resources available through the Internet is written for an audience that reads at an average or advanced literacy level. Family literacy programs can help to address the barriers that prevent full participation in the digital environment. Information Literacy: Information literacy is the ability to locate, evaluate, organize, and use information effectively. It applies to both traditional resources, such as books and documents, and the vast amount of electronic information that is now available through computers. The recent proliferation of electronic information has created a growing need to help residents develop information literacy skills—skills that enable them to compete in the marketplace, participate fully in their communities, and function successfully in society. New York's librarians have been serving as leaders in accessing, organizing, and integrating electronic information sources with traditional library services, and are already serving as the instructors of library users seeking information in all formats. Libraries are trusted resources and serve a well-known and well-accepted reference function. They are the logical and appropriate partners in an effort to promote information literacy in New York State through formal educational programs. Computer Literacy. New information technologies are transforming the services demanded of libraries and librarians. For many New Yorkers, libraries provide their first experience with information in electronic form and their only means of access to it. Even if individuals have access to computers and the Internet at home or at work, information technology changes at such a rapid pace that many simply cannot keep current without assistance. New Yorkers are turning to librarians as teachers in a far more formal way than in the past. The teaching role of librarians has expanded to include instruction in using computers, including basic computer skills, Internet use, and search techniques. Simply providing access to electronic information is not enough. As libraries provide more public-access computers and high-speed Internet connections, they must help students of all ages learn the skills to use these tools and resources effectively. In particular, the launch of NOVEL points out the need to ensure that library users have the computer skills to take advantage of new means of access and information resources. It also affords an opportunity to expand and strengthen user training. To ensure the effectiveness of libraries in their role as instructors, the Commission recommends that the Regents help libraries to develop, expand, and nurture library-based education models, and to facilitate their replication statewide. All New Yorkers will benefit from libraries serving as an additional, highly effective statewide partner in the education of New York's residents. At the foundation of American democracy is the belief that a free society must ensure the provision and preservation of accessible knowledge for all its citizens. New York must increase citizens' access to the resources of its academic, special, and research libraries while ensuring that fragile materials are preserved for future generations. The collections held by New York's academic, special, and research libraries are among the most extensive, up-to-date, and comprehensive in the world. This wealth of information is available to New Yorkers through resource-sharing agreements established by the state's Reference and Research Library Resources Systems. New York's academic, special, and research libraries—including privately funded institutions—have always been active participants in the resource-sharing network, lending far more than they borrow. However, their ability to share freely is being severely strained. Increased costs for print materials, a proliferation of distance-learning initiatives, and an ever-increasing demand for both print and electronic resources created by the catalogs, indexes, and abstracts available through the Internet have put great stress on the systems that deliver these resources. The Commission believes that sustaining and improving access to these resources is critical. Just as access to New York State's extraordinary collections is a priority, all New Yorkers also have a vital stake in preserving library materials as cultural resources. The bulk of library research materials held by the state's academic, special, and research libraries is printed on acid paper, and one-fourth of those materials is already too brittle to use. Stemming the high rate of damage and deterioration of library collections throughout the state requires greater effort and coordination. New York's nine Reference and Research Library Resources Systems (3Rs) are ideally situated to provide leadership, technical expertise, and project coordination for the academic and research initiative. All academic libraries and the vast majority of special libraries in New York are 3Rs system members. The 3Rs systems will develop action plans in partnership with the State Library, member libraries, and the eleven major research libraries to implement a coordinated program of improved access, preservation, and technology projects. Critically important partners in this initiative are the eleven New York Comprehensive Research Libraries (NYCRL): Binghamton University (SUNY), Columbia University, Cornell University, The New York Public Library, the New York State Library, New York University, SUNY Stony Brook, Syracuse University, University at Albany (SUNY), University at Buffalo (SUNY), and the University of Rochester. These libraries are national leaders in information technology, collection development, research support, and conservation and preservation of research materials. The New York State Library is a unique partner in this initiative. Its mission includes providing access for all New Yorkers—on-site and through interlibrary loan—to one of the largest public research collections in the nation. The 200-year-old collection of 18 million items in the New York State Library's Research Library contains many unique and fragile materials. Among its services to the people of the state is the collection and digitization of all state documents. Strengthening the Research Library's collections, information services, and preservation efforts—in collaboration with the state's other research libraries—and extending its hours of service to the public are essential in providing convenient, no-charge access to research materials for all residents. Library services to disabled residents of the state also require improvement. Two regional libraries—the New York State Library Talking Book and Braille Library and The New York Public Library Andrew Heiskell Library for the Blind and Physically Handicapped—and two sub-regional libraries—the Nassau Library System and the Suffolk Cooperative Library System—provide library materials and services to New York residents who are visually, physically, or learning disabled. These libraries now serve a total of 63,000 New Yorkers. However, some 295,000 residents with disabilities who are eligible for special library services and materials are not yet receiving them due to lack of support for these libraries. Expansion of access to library services for the visually, physically, and learning disabled. Electronic technologies and an increasingly diverse society have transformed library services and the skills necessary to deliver them. New Yorkers of all ages and backgrounds need the help and guidance of a skilled library workforce to make full use of library resources. Establish a certification process to promote excellence in New York's library workforce at all stages and levels: All professional librarians and library staff need continual training to stay current with developments in information technology. Currently, graduates from accredited programs of library and information science education receive certification for practice as a professional librarian for life. No certification programs exist for paraprofessionals and library managers. To ensure participation in training and continuing education, the Commission recommends a program of certification modeled after the certification and re-certification of school library media specialists, with financial incentives for libraries and library workers. Plans submitted by libraries to qualify for aid through the NY EXCELS Program should include certification and re-certification of staff. The Commission encourages the expansion of programs to instruct library managers, trustees, school superintendents and principals, and all policy-makers about 21st century library services and their effect on library policy and governance. Develop, coordinate, and deliver library education programs to improve access to library education: Programs of education must be more accessible to those who are geographically isolated, live in densely populated urban areas, or have limited time and finances. A cost-effective, coordinated statewide program of quality library education will benefit libraries by attracting potential library professionals. More significantly, it will benefit users of all types of libraries in New York State. This initiative should include incentives to stimulate collaboration among New York's seven accredited programs of graduate library education, the New York State Library, library systems, libraries, and other educational organizations in planning and providing convenient delivery of quality library education. Create a more diverse library workforce to serve New York's diverse population: The library workforce must acquire and cultivate the skills necessary to respond to the needs of an increasingly diverse, multilingual population of New Yorkers. A study conducted by the American Library Association (ALA) shows that only 5 percent of those who receive library degrees are minorities. Create paid internships for minority college students through partnerships between colleges and all types of libraries. Include library education programs among the opportunity programs sponsored by the New York State Education Department and others. Promote career opportunities in the library profession to all students in New York's secondary schools, colleges, and universities. Provide mentoring programs, modeled after programs in New York's urban libraries, for library pages and other employees in libraries throughout the state. Develop a strategy to attract and retain a well-trained, diverse workforce for urban public libraries: Urban public libraries are experiencing a tremendous shortage of staff. At the same time that demand for services is rising, the ability of urban libraries to attract and retain a well-trained and effective workforce has eroded dreadfully. New York City's public libraries, in particular, are experiencing a crisis. Salary levels for its library workforce compare unfavorably not only with those of its suburban neighbors, but also with salaries paid in other major metropolitan areas. Staff are moving to academic and suburban libraries, to the Board of Education within the city, and to private industry, where opportunities abound and salaries are reaching record levels. During the first year of service in New York City's libraries, one out of four new librarians will leave; after three years, nearly half are gone. Provide resources for scholarships and continuing education for librarians who are interested in serving in urban public libraries. Offer salary incentives to librarians who will serve in urban public libraries. Supply the resources for staff to attend professional conferences. Award entrepreneurial and innovation awards to recognize and reward talent in urban public libraries. Effective, lasting improvement in library service to the people of New York must be based on vision, commitment, innovation, and collaboration. To achieve needed change, the State Library must work closely with its leadership partners—the Office of Elementary, Middle, Secondary and Continuing Education (EMSC) and the library systems. Strong leadership within the State Library will be required to monitor and measure the implementation of the Commission's recommendations. To ensure that the State Library is fulfilling its leadership role, it will periodically report to the Board of Regents on implementation status. The Commission also recognizes that the State Library must become even more effective in communications and advocacy. It must clearly articulate the information needs of New Yorkers to benefit library users, libraries, and library systems, particularly within New York State government and the federal government. Increase all New Yorkers' awareness of library services and the need to support and improve them. Build and strengthen relationships between communities and local libraries. Develop citizen library advocates, expanding diversity in community representation. Build the capacities of local library advocates—especially in communities with low local per-capita support for libraries. Promote and develop partnerships, networks, and coalitions that will strengthen library services. Coordinate grass-roots advocacy efforts throughout the state. Nurture leadership in the library community, promoting advocacy skills and continuing education for library professionals. The Commission is very gratified that the Regents have adopted Recommendations 1 and 2 and are already moving on the first steps toward their implementation. The Board of Regents has requested $12 million in startup funds to launch NOVEL. NOVEL is an important component of the Regents Libraries 2001 Budget and Legislative Priority. The consolidated library systems in New York State are The New York Public Library, Brooklyn Public Library, and Queens Borough Public Library. School district public libraries are separate institutions from local school districts, with elected boards of trustees and annual budget votes. They are not the same as "school libraries," which are contained within school buildings and are under the jurisdiction of school authorities. Demographics of New York State, 1920-1998: A Summary of Dr. James Chapin's Research for the Regents Commission on Library Services. Regents Commission on Library Services, September 1999. The summary is included as Appendix C.
 Reder, Stephen, The State of Literacy in America, 1996. Between September 1998 and June 2000, the Commission met as a whole twelve times, with Abby Milstein presiding. At the first full meeting of the Regents Commission on Library Services on September 14, 1998, the Commission created two Task Forces: the Task Force on a Vision for Twenty-First Century Library Service and the Task Force on the Greatest Access to Library Service. The Task Force on a Vision for Twenty-First Century Library Service, led by Martin Gomez, focused on the use of new and emerging technologies to provide quality library service, preservation of library materials for future generations and developing library services to meet the needs of an increasingly diverse and multilingual population. Commission members who served on this task force are: Sandra Kennedy Bright, Monroe Fordham, William L. Jefferson, Sara Kelly Johns, John O'Rourke, Janet Steiner, Sarah E. Thomas and Betty J. Turock. The Task Force on the Greatest Access to Library Service, led by Paul W. Crumlish, focused on the problems of over one million New Yorkers unserved by local libraries, the uneven quality of library service throughout the State, the lack of technology in many of New York's libraries and the physical accessibility and construction needs of libraries. Commission members who served on this task force are: John Hammond, Gail Johnstone, Edward McCormick, Gerald Nichols and Harry Rosenfeld. Each task force met seven times between September 1998 and September 1999. All Commission members were encouraged to attend the meetings of both task forces and reports of task force activities were provided at full Commission meetings. A telephone survey of New York State residents about public library issues was conducted by the Center for Applied Research in Library and Information Science at the University at Buffalo (SUNY). Another survey, also conducted for the Commission by the Center for Applied Research in Library and Information Science, gathered data about school library media programs in the State and analyzed the impact of school library service on student achievement. A report on the demographics of New York State provided a unique correlation of demographic and library services data to inform the work of the Commission. More detail on these reports can be found in Appendices B, C and D.
The Commission held two rounds of regional public hearings to gather information from New Yorkers. The first round of hearings in May and June 1999 offered the public an opportunity to discuss the future of New York's libraries and suggest ways to improve library services. The second set of hearings, in April and May 2000, provided the public an opportunity to react to, and comment on, the Commission's preliminary statewide policy recommendations issued in March 2000. Over 500 New Yorkers provided testimony. Five hearings were held May and June 1999 in Buffalo, Syracuse, Albany, Huntington Station and Brooklyn. Another five hearings were held April and May 2000 in Rochester, Brentwood, New York City, Albany and Vestal. Those unable to attend the hearings were invited to submit written testimony to the Commission. Panel presentations and open discussions about the Commission's work were provided at the New York Library Association (NYLA) annual conference in October 1998 (Rochester) and October 1999 (Buffalo). Over 150 conference participants attended each of these sessions. Commission leaders and members addressed many groups to discuss the work of the Commission and to solicit advice, including the New York State Association of Library Boards, the New York State Association of Towns, the New York State School Boards Association, the New York Comprehensive Research Libraries and the Association of College and Research Libraries. Focus group meetings were held to discuss issues involving the three types of library systems in New York State: public library systems, school library systems and reference and research library resources systems. The first meeting to focus on the role of systems was held in Albany in November 1999. Five other meetings, which also included a discussion of the role of central libraries, were held in April and May 2000 in Albany, Brentwood, New York City, Rochester and Vestal. Meetings to focus on advocacy for New York's libraries and on education of New York's library workforce were both held in New York City in May 2000. Senator John Randy Kuhl, Jr.
Staff of the following organizations provided space and local assistance for Commission meetings and hearings. The Commission was named to the National Advocacy Honor Roll of the American Library Association (ALA) and the Association of Library Trustees and Advocates in an awards ceremony at the ALA Annual Conference in Chicago on July 7, 2000. This award was presented in recognition of the Commission's leadership in advocating for improved library service to the people of New York State and its outstanding contributions to America's libraries in the 20th century. The Commission web site has additional information on Commission members, meetings, hearings and recommendations. The Regents Commission on Library Services sponsored a survey of New York State residents to find out how New Yorkers use public libraries. The survey sought to identify their information needs and the reasons for use and non-use. The 1999 survey also identified the new library services that would be most popular and asked New Yorkers about the value of public libraries to their communities. Other questions dealt with use of the Internet. The survey was designed and managed by Dr. George D'Elia, Professor and Director of the Center for Applied Research in Library and Information Science, State University of New York at Buffalo, and Dr. Nancy Zimmerman, Associate Professor at the University at Buffalo. The Random Digit Dialing telephone survey of 1,004 adult residents of New York State was conducted from April 5 through April 23, 1999. With a sample size of 1,004 respondents, the survey data has a general margin of error of plus or minus 3 percentage points. The data was analyzed by geographic area and a number of demographic characteristics, including age, race and level of education. New Yorkers consider their local public libraries to be very important to the quality of life in their communities, and they use their libraries in numbers well above the national average. Although most respondents were pleased with their local public library, they seek an expansion of current services, as well as new means of getting information from their libraries. Highest on the list of New Yorkers' priorities are: a statewide library card that would give cardholders access to library resources throughout the state; increased use of technology, including Internet access to their library from home and delivery of information by fax or e-mail; library programs in local community centers; database searching services; homework tutors for students; and non-English library programs. And New Yorkers are willing to pay for these new services. The respondents said that financial support for libraries should be doubled, increasing spending from the New York State average of $32.17 per capita to an average of $64.07, according to 67 percent of those surveyed through the telephone poll. The survey results revealed that 73% of households in New York State used their public library. The national average of library use among households is 65%. The survey revealed that libraries are greatly used by students, families with children under 18, homemakers, retired New Yorkers, the underemployed, and the unemployed, with the urban minority population showing a greater interest and commitment than those in the rural or suburban majority populations. New Yorkers most commonly seek information from their public libraries on current news, personal health, computer/technology, cultural and community news, and self-help. Reasons cited by New Yorkers for not using their local library include accessibility problems such as location, hours or parking availability. The following reports were generated by this survey and are available upon request from the Commission office (518/474-1195). Copies are also available on interlibrary loan from the New York State Library and from other libraries serving as depositories for New York State documents. A Telephone Survey of Residents of New York State Concerning Library Services: Executive Summary and Guide to the Narrative Report. Prepared for the New York State Regents Commission on Library Services, September 1999, 38 pages. A Telephone Survey of Residents of New York State Concerning Library Services: Narrative Report of the Results. 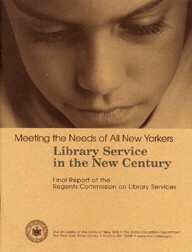 Prepared for the New York State Commission on Library Services, September 1999, 102 pages. Dr. James B. Chapin is a member and Past-president of the Board of Trustees of the Queens Borough Public Library. He is the Senior Policy Advisor to the New York City Public Advocate. He has taught history at Yale University and Rutgers University and political science at Queens College of the City University of New York. Dr. Chapin is the author of over 100 articles. This paper provides a summary of the data and analysis provided to the Regents Commission on Library Services by Dr. James Chapin. The Commission asked Dr. Chapin to report and analyze the demographics of New York State to provide a context for a broad examination of library services in New York State. Dr. Chapin's report will assist Commission members as they consider recommendations that will provide the greatest access to library services for all New Yorkers and develop a vision for library services in the 21st century. Compiled by the Commission to focus on key findings identified in Dr. Chapin's research, this paper is followed by a series of questions, with answers supplied by Dr. Chapin. Basic population data for 1920 through 1998 shows population changes for the State as a whole, by decade, compared to the United States as a whole. The report also provides an analysis for New York State counties from 1920 to 1998. Dr. Chapin notes that, because the research was conducted on the county level, it does not show differences in library services that are intra-county rather than inter-county. Until 1930, New York State grew faster than the United States as a whole. After 1945, the State's growth fell behind that of the country. Slow growth was replaced by actual population loss in the 1970's. Despite heavy immigration into the region, New York's population has stagnated for the last two decades (1978-1998). Overall, the State's share of national population has dropped from 10.2% in 1940 to just 6.7% today. Until 1960, the growth in the state was heavily concentrated in the New York City region and in the major urban areas upstate. Beginning in 1960, the pattern of growth changed. After 1960, it is in exurban regions far from New York City, and in very few other places. Dr. Chapin found that, in many counties upstate, it is possible to point to the location of a particular Federal or State institution as the reason for a spurt of growth. Not only is post-1960 growth smaller and rarer than earlier growth, it generally reflects governmental decisions far more than private decisions. At the most basic level, it is easy to distinguish the regions of the state from each other. New York City is home to both the wealthiest and the poorest people in the State. New York City also contains the great bulk of the non-white population of the State. Dr. Chapin observed that Manhattan is unique among America's more than 3000 counties, both in its continued concentration of wealthy people and in its central status in the world economy. He speculates that the existence of Manhattan has masked the extent of New York State's decline since 1970. Most of the other counties (outside of New York City) in the state have limited population and economic growth, with the exception of the ever-broadening belt north of New York City. Findings show that suburbs with some minority population have the highest incomes in the State. The older suburbs have stagnant populations, and only the outer suburban ring is still growing. In the case of New York City, much of this suburban ring is in two neighboring states: Connecticut and New Jersey. The counties containing major upstate cities have dramatically different populations from the suburban counties or New York City. For example, the cities of Albany, Buffalo, Rochester and Syracuse have only 25% of their respective counties' white population living within their boundaries, but a full 89% of the black population in the county live within city boundaries. Dr. Chapin finds that the income of a county correlates very closely with the percentage of college graduates in the county. Since college graduates, like minorities, are concentrated in urban and suburban areas, the result is a correlation of higher incomes with higher minority populations. Dr. Chapin points out that minorities are less wealthy than majority populations and that means that the actual income gap between the white populations in urban/suburban areas and that in rural areas is even greater than it appears in the data. The minority population of the state is heavily concentrated, while the two-thirds of the state population that is non-Hispanic white is widely dispersed. The figures presented indicate that the most prosperous counties have fewer old and young people. Dr. Chapin concludes that this is the result of the life-cycle effect and of population change effects. There is a similarity in variation between spending on libraries and spending on schools--with the greatest expenditures in both coming in "old-growth" suburbs, followed by urban counties, with rural counties spending the least on school and libraries. Dr. Chapin speculates that, although cost-of-living differences are not factored into these equations, the worst library service would be found in rural counties with per capita library expenditures under $10. He notes that non-local library expenditures, defined as a combination of state, Federal, private, fines and fees, do not seem to be allocated on any consistent basis. Dr. Chapin concludes that the key finding of his report is that per capita library expenditures correlate so closely with per capita library use. He reports that, in the smaller counties, it can be translated into simpler terms. For every dollar spent on per capita library services, per capita circulation increases by .22. Clearly stating his belief that every citizen of New York State should have access to library services, Dr. Chapin contends that it should be the responsibility of the state to encourage counties to establish such services and to help the poorer areas to provide them. Dr. Chapin credits the following staff at the Queens Borough Public Library who helped with this project: Gary E. Strong, Director; Tom Galante, Deputy Director for Finance and Information Systems; Carol Sheffer, Director, Programs and Services Department; Mary Little, Departmental Assistance, Programs and Services Department; Fred Gitner, Assistant Head, New Americans Program, Programs and Services Department; Lacey Chan, New Americans Program Librarian, Programs and Services Department; Samantha Thomas, Assistant, Information Technology and Systems and Andrew Schlein, Director of Information Technology and Systems. Dr. Chapin also recognizes the assistance of Maria Hazapis, Education Program Aide, New York State Library, for providing the raw data for the report. The Regents Commission on Library Services is grateful to Dr. Chapin and the Trustees and staff of the Queens Borough Public Library for their extraordinary contribution to the work of the Commission. Question: What does the data indicate regarding population density? Dr. Chapin: You can see that we ran correlations on the % rural from the census and population per square mile. The population per square mile ranges from more than 55,000 in Manhattan to 3 in Hamilton County. It correlates negatively with white population at .83 across the whole state. Because of the relatively low funding given to the New York City system relative to its suburbs, it does not correlate very strongly with library income (.22) although excluding New York City makes that correlation very high (.82). The percent rural population correlates at a negative .66 with library income (with or without New York City). Essentially, the rural counties have the lowest library expenditures, followed by the urban counties, with the suburban counties being the best funded by far. Question: What does the data indicate about proximity of a library? Dr. Chapin: I cannot judge the proximity of a library on the basis of the data I have. Question: What is the correlation, both positive and negative, between your data and the results of the telephone poll? Dr. Chapin: Two things are of note in the poll—it understates the minority population of the state by about half, and many of the sub-samples (sizes such as 18) are too small to be useful. Also, lacking full cross-tables of demographic characteristics from the poll, it is impossible to make any substantial correlation between its results and the results of the county-level analysis. I do note that the under-sampling of minorities and the extremely disparate nature of the white population probably led to some of the "non-results" of the poll. For example, older people are concentrated in poorer and less-served counties, which may explain why the expected increase in use by older people did not occur. (Also, older people are less educated than younger people.) If these factors are held constant, it is quite possible that older people use the libraries more than younger ones. Question: Can you comment on the strong correlation in your report between library income and circulation? Dr. Chapin: In the preliminary report, we ran a straight-line regression analysis on the 53 counties outside the city to arrive at a figure of an increase of .22 in per capita circulation for each dollar spent. In fact, the scatter-plot results are better explained by a logarithmic curve, and we present such results for 62, 57, and 53 counties respectively (see below). You will note that the third column shows the expected 4.28 circulation at $10 per capita increases by 2.55 for the next $10 spent (to $20), by 1.55 for the third $10, and by 1.06 for the fourth ten dollars. Bluntly put, in library service at least, we get what we pay for. But the increase trails off, so that the first $20 is by far the most valuable. Question: Can you comment on your finding that an increase in $20 per capita will result in a substantial increase in circulation for every dollar invested. Dr. Chapin: Your question slightly misstates my argument. I am not arguing for an increase "in" $20 per capita but for an increase "to" a floor of $20. This "should" produce circulation larger than 6.4 per capita for all the counties outside New York City. Question: Can you comment on your contention that libraries are one of the few public services that can achieve economies of scale and be improved by merger? Dr. Chapin: It was not my contention that libraries are among the few services that benefit from consolidation. This idea appeared in a pamphlet by the conservative Manhattan Institute in a paper advocating the break-up of municipal governments! According to an analysis of the Dade County area in Florida by Professor Milan Dluhy, economies of scale were obtained only for library and fire services. Question: How can we increase statewide library use? Dr. Chapin: The most necessary step to improving statewide library use is to have local library service be a right in the State. More than a million New Yorkers have NO public library to serve them. Having accomplished this step, the next step must be to provide some minimal standards of expenditure and of location for libraries in relation to the population they serve. Step three must be continuous monitoring of what the public wants, expects, and knows of library service. Public entities can and should monitor service delivery and performance the same way that private entities do. This is the reason that the Queens Borough Public Library keeps such close track of circulation, polls the borough every few years (with a sample of 2,500! ), arranges its floor-space in ways designed to attract use, gets best-sellers to the shelves as soon as they hit the stores, and seeks publicity. If you act like a customer-oriented entity, you will get the results that good businesses do, including high product awareness, a good reputation, and repeat customers. And, by the way, these activities result in more support for library services. Finally, in a society in which life-long education is becoming a necessity, not a luxury, libraries should not be considered a luxury, but as a necessity! In 1988, Information Power: Guidelines for School Library Media Programs, published by the American Association of School Librarians (AASL) and the Association for Educational Communications and Technology (AECT), defined the multiple roles of the school library media specialist (SLMS) and emphasized the impact an effective school library media (SLM) program could have on student achievement. 1998 saw the release of Information Power: Building Partnerships for Learning which contained the Information Literacy Standards for Student Learning and further defined the changing roles of the SLMS and stressed the importance of information literacy in student achievement. [D1] In 1993, the Colorado State Department of Education under the direction of Keith Lance conducted a study to examine the impact of school library media centers (SLMCS) on student academic achievement using the tenets of Information Power with positive results. The presence of a professionally trained, certified school library media specialist (SLMS) and a large and diverse collection lead to higher student test scores. The more time SLMSs and teachers spend working together and collaborating on instruction, the higher scores students make on tests. Schools with certified SLMSs are more likely to be integrating information literacy standards with content standards, and such schools are almost three times as likely to have SLMSs participating in the development of such standards. Minimal gains in information literacy and study skills can be achieved through instruction by either the classroom teacher or the SLMS. Effective instruction depends on collaborative planning and teaching of both teacher and SLMS; stated another way, scheduled library classes taught solely by the SLMS are not as effective as integrated, collaboratively planned and taught programs. Flexibly scheduled SLMCs provide greater academic benefits. Schools in states with above average reading scores have schools where students have greater access to certified SLMSs, visit SLMCs more frequently, and borrow more books and other materials. The Commission contracted with Drs. George D'Elia and Nancy Zimmerman of the Center for Applied Research in Library and Information Studies (CARLIS) at the University at Buffalo, State University of New York to survey School Library Media Specialists and provide data to inform the Commission. The data from this survey was analyzed with test data and with data determining school similarity from the New York State Education Department (NYSED) to examine the impact of library media centers on student achievement. This submission is a report on the findings of this study. needs of the school student population. The amalgam of demographic data for the school districts used to establish the N/CR groupings combines the best indicators of educational need -- school district student poverty and English Language proficiency -- with financial resources of the school district, district enrollment, and district land area. Within the need-to-resource capacity index groups, there is a marked variability between schools in the demographics of their students. The New York State Education Department attempted to develop groupings that would allow reasonable comparison based on the challenges faced by particular schools, yet find a balance between having too many groups with too few schools in each, and too few groups where schools are less fairly compared. to find out if the data collected by the SLM survey, when analyzed with the N/CR data provided by the New York State Education Department, included factors which impact on student achievement as determined by 4th and 8th grade English/Language Arts and Math test scores. Given the limited resources of time and money available to conduct this study, the design proposed to utilize the N/CR Index groupings and test scores already available from the New York State Education Department. While the N/CR groupings include some of the school and community characteristics utilized in the other studies cited on the impact of SLM on student achievement, all the variables studied are not included. Raw data on the discrete elements that determine the N/CR were not available, so analyses was confined to those variables included in the N/CR formula and the N/CR Index grouping of those elements. Also, a breakdown of the New York City schools into smaller N/CR groupings was not available, so all New York City schools were analyzed together as one N/CR Index grouping. Acknowledging the limitations of using the N/CR as a way of comparing similar schools and controlling for socioeconomic factors, the researchers concluded these data were the best available given the constraints of time and cost. to examine the amount of time SLMSs spend in their roles of teachers, information specialists, and instructional partners with teachers. In December 1999, the questionnaires were mailed, using labels supplied by the NYSED, to 3,400 of the 4,129 public schools with libraries in New York State. The questionnaires were only mailed to schools that had students in grades 4 and 8 who took the new English/Language Arts and Math tests required by the New York State Education Department during the 1998-1999 school year. Data was not collected from schools that did not have students in grades 4 or 8 since there would not be corresponding test score data. The person responsible for the day-to-day operations of the SLMC was asked to complete the questionnaire. Respondents were directed to return questionnaires by mail to Drs. Zimmerman and D'Elia. The closing date for survey return was set for January 14, 2000, but was extended until February 15, 2000 to include all responses. Survey responses were recorded and coded using SPSS, the Statistical Package for the Social Sciences. Analysis of variance tests were run to examine survey results with test scores for 4th and 8th grade English/Language Arts and Math tests, as obtained from the New York State Education Department, for all responding schools. Then survey responses were run with test scores for each N/CR Index groupings. Tests resulting in a F<.05 are considered statistically significant for this study. Finally, using SPSS, multiple tests of correlation were run for the entire state and for each N/CR grouping. A correlation serves the purpose of assessing the strength of the relationship between two variables and a correlation resulting in P=.2 or higher is considered significant. By the closing date of February 15, 2000, 2,032 of the 3,400 surveys were returned for an overall response rate of 59.7 per cent. The response rate for New York City schools was 24.6 per cent and the response rate for schools outside of New York City was 75.4 per cent. Previous studies found that there is a link between the presence of a certified SLMS and higher student academic achievement so the specific certification status of SLMC personnel was sought. Of the respondents, 94.8 per cent report holding a New York State (NYS) teacher certification, but of those certified only 76.7 per cent hold New York State teacher certification in school library media (SLM). This means that 18.1 per cent of the respondents responsible for the operation and instruction of students in the SLMC do not have NYS certification in the SLM field and 5.2 per cent are staffed by persons holding no teaching certification at all, so 23.3 per cent, nearly 1/4 of the responding schools, have SLMCs not staffed by a certified school library media specialists. For NYC schools, 7.3 per cent of the respondents hold no teacher certification and 66.9 per cent hold teacher certification, but not in SLM. Only 25.8 per cent of the respondents hold NYS certification as a SLMS. For schools outside of New York City, however, 88.5 per cent hold NYS certification as a SLMS, only 4.8 per cent hold no certification, and 6.7 per cent hold certification as teachers but not in SLM. Length of Employment Common wisdom would suggest that it takes time to develop an effective SLM program. To that end, length of employment in present position was explored. Responding to length of employment in present position, 39.7 per cent of the respondents report being employed five years or less; 20.3 per cent from six to ten years; 15.1 per cent from eleven to fifteen years; 7.7 per cent from sixteen to twenty years; 5.1 per cent from twenty-one to twenty-five years; 6.4 per cent from twenty-six to thirty years; and 2.5 percent reporting being employed more than thirty years. Years of employment reported ranged from less than one year to forty-one years in present position. Since success of any SLM program in promoting academic achievement depends fundamentally on the presence of adequate staffing, staffing levels of SLMCs were examined. Questions were asked to determine the staffing level of certified personnel assigned to the SLMC to the nearest total full time equivalent. Of all responding, 4.7 per cent reported having no certified (with either teacher or SLM certification) staff in the SLMC; 83.3 per cent reported certified staffing level to be I FTE; 3 per cent reported certified staffing level to be 1.5 FTE; and 3.9 per cent reported certified staffing level to be 2 FTE. Questions were asked to determine the staffing level of classified or other paraprofessional staff. Of all respondents, 29.5 per cent reported having no classified staff in the SLMC; 7.3 percent reported classified staffing level at .5 FTE; 43.8 per cent reported classified staffing level at I FTE; 2.2 per cent reported classified staffing level at 1.5 FTE; 7.2 per cent reported classified staffing level at 2 FTE; and 1.9 percent reported classified staffing level at 3 FTE. Despite research evidence that flexible scheduling, or access to the SLMC at point of instructional need, provides greater academic benefits, only 28.2 per cent of the respondents report scheduling that is completely flexible. A completely fixed schedule, where students come to the SLMC only at scheduled times, is reported by 45.9 per cent of the respondents and 25.9 per cent report a mix of fixed and flexible scheduling. That means students in 71.8 per cent of the responding schools do not have access to the SLMC at the point of instructional need but only during prescheduled times. Fifty per cent of those responding report that scheduling of the SLMC is used to provide contractual planning time for classroom teachers despite what is known about academic effectiveness. Much of the research taking place after the publication of Information Power: Guidelines for School Library Media Programs in 1988 focuses on the multiple roles of the SLMS, especially the instructional role. Studies found that students whose SLMSs played an instructional role either by identifying materials to be used with teacher-planned instructional units or by collaborating with teachers in planning and delivering instruction, tended to achieve higher test scores. Noting the bias that might affect the self-reporting of time spent on various roles and activities, researchers sought to obtain this information by using descriptive terms from two different sources to describe the roles and activities of SLMS. Respondents were first asked to estimate the percentage of time spent during an average workweek in the four roles defined by Information Power: Building Partnerships for Learning: Role I. Teacher; Role 2. Instructional Partner; Role 3. Information Specialist; and Role 4. Program Administrator. The mean time as reported by respondents spent on Role I. Teacher was 53.8 per cent; on Role 2. Instructional Partner was 12.2 per cent; on Role 3. Information Specialist was 18.2 per cent; and on Role 4. Program Administrator was 15.5 per cent. In order to further explore this question and to minimize the problems of self- reporting, respondents were asked to estimate the percentage of time spent on three separate groups of activities in a typical work week, as described in Taxonomies of the School Library Media Program by David Loertscher: Activities Group A: Development, Maintenance and Management of the Collection and Facility; Activities Group B: Direct Services to Teachers and Students; and Activities Group C: Collaborative Program Planning and Teaching. The mean time reported spent on Activities Group A was 34.7 per cent; on Activities Group B was 50.8 per cent; and on Activities Group C was 14.1 per cent. Responses to both questions reveal that the percentage of time devoted to the instructional partner role and collaborative planning activities (the ones previous studies indicate have the most effect on student achievement) were those with the lowest reported percentage of time spent. The first data analyses conducted was to run a One-way Analysis of Variance of the Mean test scores for each of the four tests, 4th grade English/Language Arts, 4th grade Math, 8th grade English/Language Arts and 8th grade Math, by the certification status of personnel charged with the day-to-day operation of the SLMC in each school. On all four tests statewide there was a statistically significant difference ( F=.00) in test scores of those students in schools with a certified SLMS. Students in schools with certified SLMSs had statistically significant higher test scores than those students in schools with no certified personnel in the SLMC or those with teachers not certified in SLM. There is a statistically significant difference when the SLMS is certified only as a SLMS and when the SLMS held multiple certifications. The important factor was the presence of a certified SLMS. Small sample sizes made analysis of this data for New York City alone unreliable. [D1] AASL and AECT. Information Power: Guidelines for School Library Media Programs. Chicago: ALA, 1988. AASL and AECT. Information Power: Building Partnerships for Learning, Chicago: ALA, 1998. Dr. Haycock's analyses is published in: Haycock, Ken. What Works: Research About Teaching and Learning Through the School's Library Resource Center. Seattle: Rockland Press, 1992. Create information literate students in all K-12 public schools of New York State by providing equitable access to school library media programs that include resources, technology, and appropriately certified professional staff. State Aid in the form of School Library Media Program Support Aid funds will be provided to schools that evaluate their school library media programs according to standards established by the State Education Department. Standards will address the adequacy of resources, technology, and certified professional staff. Formula aid will be allocated to schools to close the gap where inadequate or inappropriate resources, technology, or professional staffing exist in school library media programs. State Aid will be used to enhance the resources, technology or professional staffing of school library media programs which demonstrate that they meet or exceed the state standards. Resources, including print, nonprint, and electronic-based materials, will be provided for all students at developmentally appropriate levels. Technology, including expanded Internet access, will be used to meet the diverse learning needs of all students. Professional staff (certified School Library Media Specialist) will provide instruction, select and evaluate resources, collaborate as an instructional partner with other teachers, and administer a program that ensures information literate students. We believe that all students must become information literate: they must be able to locate and evaluate information now and throughout their lives to meet their educational and personal needs and goals and to become productive citizens in a democratic society. We believe that all students must achieve the 28 New York State Learning Standards and the 9 Information Literacy Standards of the American Association of School Librarians in order to become information literate. We believe that all students must have equitable access to ideas and information. Develop students who exhibit a commitment to lifelong learning. Use State Aid to meet the technology needs of library media programs, e.g., technology for instruction and access and increased Internet access for all students. A. Launched in January 1999 by the New York State Library, EmpireLink is a statewide electronic database access project. EmpireLink provides FREE access to commercial, full-text, multidisciplinary databases including sources for health information and access to current or past editions of more than 100 domestic and international newspapers. Q. Who is eligible to participate in EmpireLink and what other benefits do they receive? State to the extent permitted by negotiations and contractual limitations. Every $1 the State invests in EmpireLink results in $25 worth of access at the local level. Q. How can EmpireLink be accessed? A.EmpireLink may be accessed from any eligible library in the State. Libraries that have the computer capability, usually through their library systems, may also choose to offer library users remote access to EmpireLink electronic databases, from their homes, schools, or workplaces, 24 hours per day, 7 days per week. Q. How can my library register to use EmpireLink? Arrangements for remote access are usually made by the libraries with their library systems. Q. What databases are available through EmpireLink? A. Currently, there are two databases: Health Reference Center—Academic(HRC-A) offered by The Gale Group and Dialog@Carl—Basic Collection offered by the Carl Corporation. The HRC-A database is a source for both medical care professionals and consumers about important health information. This multi-source database currently provides access to full-text journals in medicine, nursing and allied health, consumer health, including nutrition, and more. HRC-A also contains, full-text pamphlets and selected health-related articles from an additional 1500 general interest magazines, as well as health-related and topical overviews. Dialog@Carl - Basic Collection database contains approximately 300 multidisciplinary databases, including the News Collection. The News Collection consists of over 100 newspaper and newswire databases. Q. Is training offered for the databases available through EmpireLink? If so, is there a fee? Is training required in order to for libraries to participate? A. Regional "train the trainer" sessions are offered for each EmpireLink database. There is no fee for training. Although not required for libraries to participate in EmpireLink, training is highly recommended for staff in libraries where a database offered through EmpireLink is being introduced in the library for the first time. Since January 1999, a total of 1,150 people have been trained in the 39 training sessions through EmpireLink (25 training sessions for the Health Reference Center—Academic database, 615 people trained; 14 training sessions for Dialog@Carl, 535 people trained). If needed, additional regional training sessions may be requested by any of the 73 Library Systems in New York State. To arrange an additional training session, a Library System representative should call the EmpireLink Help Desk (877) 277-0250. Q. How is EmpireLink funded? A. EmpireLink is a three-year pilot project funded through a Library Services and Technology Act (LSTA) grant to the New York State Library by the Federal Institute of Museum and Library Services (IMLS). Q. How many libraries and library systems are currently registered to use EmpireLink? A. 2,385 libraries and library systems have registered for the Health Reference Center—Academic database since January 1999; 1,500 libraries have registered for the Dialog@Carl—Basic Collection database since September 1999. Q. What other services are provided for participants in EmpireLink? An EmpireLink Help Desk service, provided by the New York State Library, is staffed from 8:00 a.m. to 4:00 p.m., Monday through Friday to respond to questions and concerns about the databases offered through EmpireLink. The toll-free telephone number for the Help Desk is (877) 277-0250. Additional information may be found at the New York State Library EmpireLink web site or the Help Desk (877) 277-0250. The following figures compare per capita local funding and per capita tax valuation for two types of public libraries: public town libraries and school district public libraries. The public town library does not offer the public an opportunity to vote on library budgets as the school district public library does. The figures provided below show that there is better local support for libraries that follow the models specified in Recommendation 3 and provide the public the opportunity to vote on library budgets. The school district public library is one of the models cited in Recommendation 3 that libraries can adopt to become Public Library Districts. School district public libraries are separate institutions from local school districts, with elected boards of trustees and annual public votes on library budgets. The average tax value per capita figures are shown to indicate the average wealth of communities. The average funding per capita represents the total income, from either school district or the town, divided by the population the libraries are chartered to serve. The average tax value per capita represents the taxable full valuation for the respective school district or town divided by the population base for that school district or town. [G1] Source: Public and Association Libraries Statistics Data for 1996 and 1997, Division of Library Development, New York State Library. 50 percent do not have the minimum of one parking space designated "handicapped parking" for every 25 non-handicapped parking spots. 69% feel their present library facility will not adequately serve their patrons from the next 5 years without major improvements. New York's 7000 libraries are served by an interlocking network of 74 library systems, consisting of 23 public library systems, 42 school library systems, and nine Reference and Research Library Resources Systems (3Rs). These systems were created by the Regents and the State Legislature to provide services designed to address the needs of their member libraries and to provide economies of scale in making services available to libraries that could otherwise not afford them. Systems also equalize the quality of library services throughout the state. Public Library Systems: Public library systems were created approximately 40 years ago to serve public libraries. They provide a range of direct support services to public libraries that enable them and their branches to serve their communities better. The State Library includes two divisions, the Research Library and the Division of Library Development. The Research Library is the principal library for New York State government. It extends its services to the entire state. Its collection numbers more than 20 million items. The collection is particularly strong in law, social and health sciences, legislative matters, technology, education, and history. It is one of the 125 largest research libraries in North America and the only state library to qualify for membership in the Association of Research Libraries. Its federal and state government documents and manuscript and rare-book collections are treasures of the state. The skills, knowledge, and performance of its staff are important to libraries and individuals of all ages throughout New York. The Talking Book and Braille Library, which is part of the Research Library, serves nearly 40,000 people in 55 upstate counties, each of whom has some visual, physical, or learning disability. The Division of Library Development works in partnership with the state's library systems to bring cost-effective, high-quality library services to the millions of people who use New York's 7,000 academic, public, school, and special libraries. Librarians, trustees, public officials, and community leaders depend on the DLD as they solve problems and find new ways of making library services and resources available to people in their communities. The DLD makes recommendations on statewide policy to the State Librarian. The staff administers more than $100 million in state and federal aid for the improvement of library services in New York State. For a number of years, the State Library has served in a leadership role to assist libraries in navigating the road to the information highway of the 21st century. Most recently, the State Library assisted libraries and systems through funding, training, and technical assistance in applying for E-rate telecommunications discounts and Gates Library Foundation State Partnership Grant Initiative funds, and in launching the EmpireLink project. Two years ago, you charged a commission with taking a visionary look at library service in New York State and developing a comprehensive set of policy recommendations to improve library service for all New Yorkers. We have worked diligently for these two years and are proud to present to you today our final report: "Meeting the Needs of All New Yorkers: Library Service in the New Century." Your timing in creating this Commission was propitious. Libraries stand poised at the forefront of society's transition into the new world of the information age. Although the technological revolution is only in its infancy, for millions of New Yorkers, libraries are already the portal to the digital universe and librarians are the educators for the new age. Libraries are being used more now than ever before. The library is still the place where people of all ages go to read and think and learn; to acquire information, knowledge, and wisdom; to achieve empowerment, autonomy, and success; and to participate in the life of the community and society as a whole. For millions of New Yorkers, however, libraries are now barely able to fulfill those traditional functions, if they are able at all. The ten recommendations in our report, taken together, offer a plan to enable New Yorkers to realize all the benefits of a strong library system on into the 21st century. More than embracing any individual recommendation, we urge you to take the moment of adoption of this report to make a renewed substantial commitment to libraries as essential institutions in the lives of New Yorkers. The Commission sees the ten recommendations as an integrated whole. They embody our comprehensive vision of library service for all New Yorkers. In broad strokes, we see a future in which all New Yorkers live in a public library district, and can visit a library that is accessible, and at a minimum, meets current construction standards. The library will fulfill no less than the basic needs of users, even in the poorest areas, and will be striving for excellence through the NY EXCELS Program. The library will address the learning needs of its population through collections and programs that promote literacy, information literacy, and computer literacy for users of all ages. Users will have access to a statewide digital library, NOVEL, and with e-library cards, access will be possible from remote locations as well. Fully staffed urban libraries will be open all the hours needed to serve their large populations and will offer programs and collections that meet the demand of their very diverse populations. Schoolchildren will become information literate in strong school library programs. All New Yorkers who have a need for the resources of research and special libraries will gain access to New York's superb collections through enhanced programs of cooperation, and the treasures themselves will be preserved for posterity. A diverse cadre of librarians will be skilled in the new roles required of them. Libraries of all types will be supported by efficient, effective system leadership. The New York State Library will provide a platform of support and advocacy for all of New York's libraries and library users. Our first recommendation, NOVEL, the New York Online Virtual Electronic Library, will effectively deliver high-quality, reliable digital information to all New Yorkers. You have already endorsed the idea of NOVEL and have proposed a modest beginning. We urge you to do NOVEL right. That means a commitment to propel New York to the top ranks among the 37 other states that have already begun to provide their residents with a statewide digital library. The notion of NOVEL is not a frill or a gimmick. In today's world, it has become a vital service. The economies of scale and benefits to all derived from a statewide digital library make the case for NOVEL truly compelling. Recommendation 2, the ensuring of information literacy among elementary school students, is also one you have already endorsed. We urge you to follow through on your beginning and reverse decades of inattention to the library needs of our students, particularly in the less advantaged school districts in our state. The technological age brings a risk of exacerbating the gap between the skills and achievements of students in rich districts and those in poor ones. Please don't let our children fall into the so-called digital divide. Insist on strong school library media programs. Work towards appropriately certified professional staff, adequate resources, and access to technology for all New York's schoolchildren. The persistent problem of approximately 1.3 million New Yorkers who live outside the chartered service area of any public library is not amenable to an easy or perfect solution. In Recommendation 3, the Commission has walked a fine line to preserve cherished existing libraries and yet offer a mechanism for change that will bring service to the unserved. We propose a five-year plan in which public libraries will be encouraged to evolve into Public Library Districts that will serve all New Yorkers. Among our goals are election of trustees and a public vote on the library budget, as experience has shown that this almost always results in greater local support for libraries. Libraries would have multiple options for ways to evolve into Public Library Districts. No library would be forced to change. At the end, if our plan is successful, we will see better-supported local library service across the state. Recommendation 4 addresses the huge disparity in library support and quality of service throughout New York. First it would use need-based aid to set a floor of $20 per capita in spending so that every New Yorker can enjoy the benefits of basic public library service in today's world. Second, it would spur ever-increasing efforts towards service excellence. Through the NY EXCELS Program, all types of libraries and library systems would be eligible for need-based enabling aid and for incentive aid to encourage accomplishment of objectives set in consultation with systems and the New York State Library. Significant state support for construction, expansion, and renovation of libraries, proposed in Recommendation 5, is vital. At present, documented needs total $800 million. Existing state aid stands at $800,000 per year. The Commission applauds your recent proposal of $90 million over five years, but more must be done. The Commission urges need-based formulas and the use of state dollars to leverage local support. Libraries in the 21st century are still physical places. They are physical repositories. They are quiet spaces. They are gathering spots for story hours and adult education. They are home to computers and computer instruction for millions of people. They are community centers for learning and living together. We know that a problem of this magnitude won't be solved overnight. But you must know that this issue won't go away. The situation will only get worse over time. Urban libraries in New York state serve all their residents. They don't need incentives to reach out to the unserved. But they do need help to meet the unique needs and challenges of densely populated, diverse, disadvantaged communities. Recommendation 6 would improve the capacity of urban libraries to meet those needs with support for longer hours of branch operation, programming and collection development in diverse languages, English for Speakers of Other Languages and citizenship courses, and outreach to the inner-city residents who most need their services. Libraries are an essential arm of the education infrastructure of New York. Recommendation 7 calls for a significant recognition of that role. All libraries need help to meet the needs of our residents for assistance in English and family literacy, for information literacy, and for computer literacy. Without these skills, too many people will be unable to participate fully and productively in the life of the community and the state. Recommendation 8 speaks to the large number of specialized resources and libraries in New York State. We are home to great treasures. As stewards of irreplaceable items and collections, we must stem the advancing tide of crumbling pages and increase our support for the work of preservation. Our network of academic, research, and special libraries is also a great asset. Through support for such efforts as NOVEL, and numerous cooperative programs, we have the opportunity to greatly increase the accessibility and availability of these great resources statewide. Many libraries have quietly risen to the challenges of the information age and transformed themselves into public educators and guides to the new technological world. Recommendation 9 offers concrete proposals intended to ensure a highly skilled library workforce capable of delivering to all New Yorkers the enhanced service we all hope to achieve. We propose a certification and re-certification process, programs to make library education more readily available through use of distance learning and the establishment of teaching libraries, incentives to recruit more minorities to the library workforce, and strategies to attract and retain librarians in urban libraries that are currently facing a crisis. Recommendation 10 recognizes the essential role to be played by the New York State Library in leading us to the new vision of library service for all New Yorkers contained in this report. and your own Regents Advisory Council on Libraries. You charged us with developing a vision for the future that would solve the problems of the past. Vision doesn't come cheaply. But we hope you will see this plan, as we do, not so much as a cost, but as an investment. As with all investments in education, the payoff comes over time and in myriad ways for individuals and for society as a whole. We have completed the mission with which we were entrusted. New Yorkers now look to you, the New York State Regents, to seize this rare moment and set the course for a new age for libraries in New York. We call upon you to adopt this report and give it your best efforts to make it a reality. The library community stands ready to follow your lead.